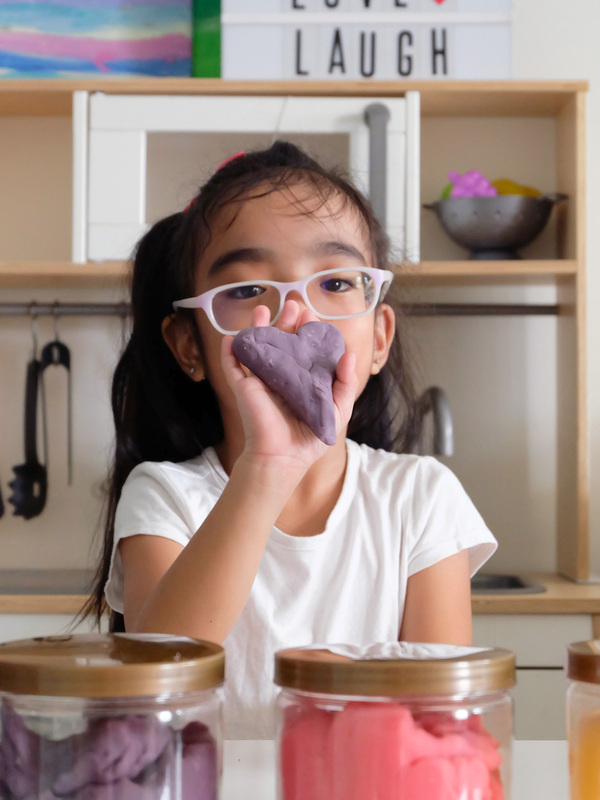 Making play dough at home is pretty quick and simple, so for this batch, I asked Zoë to help out. It does, however, involve a bit of stove-top cooking, so you may opt to let younger kids watch instead. 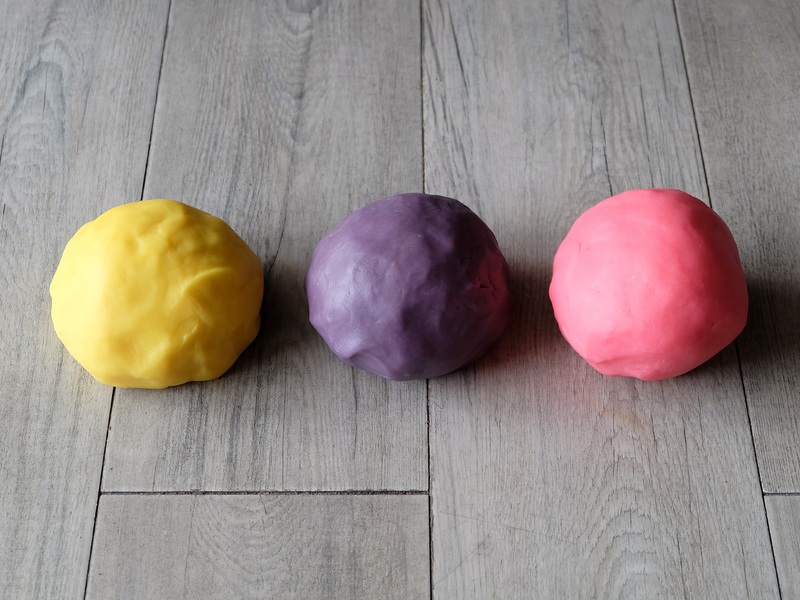 This recipe also makes a huge ball of dough, around the size of two to three tubs of store-bought Play-Doh, but you should be able to make smaller batches by dividing the ingredients. 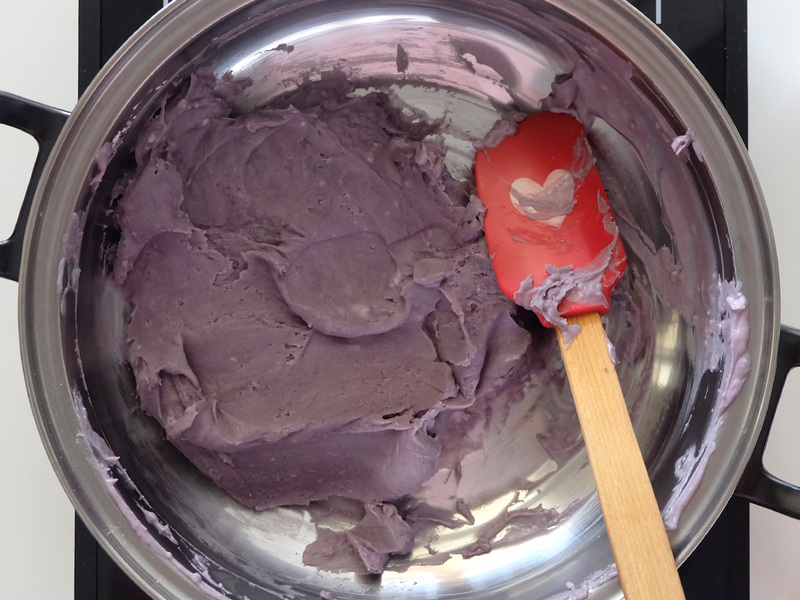 In a saucepan, add 1 cup flour, 1/3 cup salt and 2 teaspoons cream of tartar. Yes, make sure you put that much salt– it helps preserve the dough and makes it last for months. Try not to skip the cream of tartar, either. 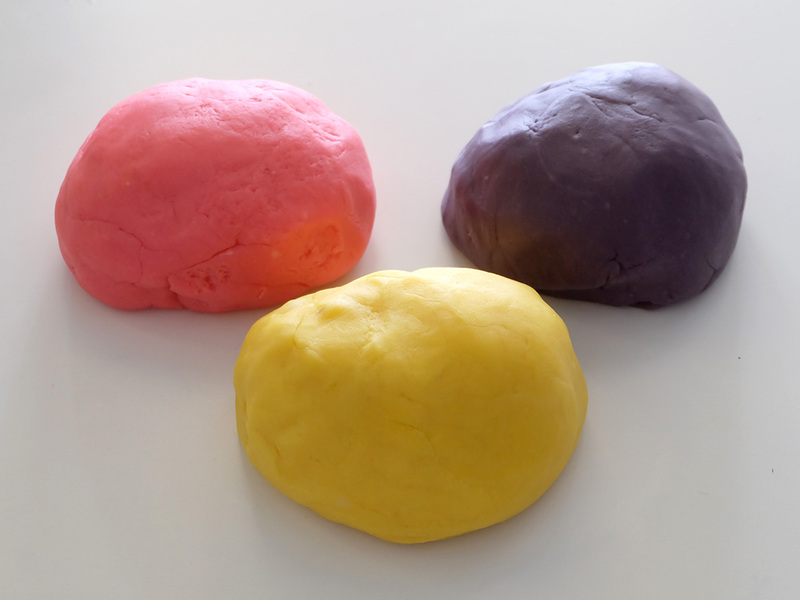 It helps give the dough some volume and elasticity, making it soft and pliable. 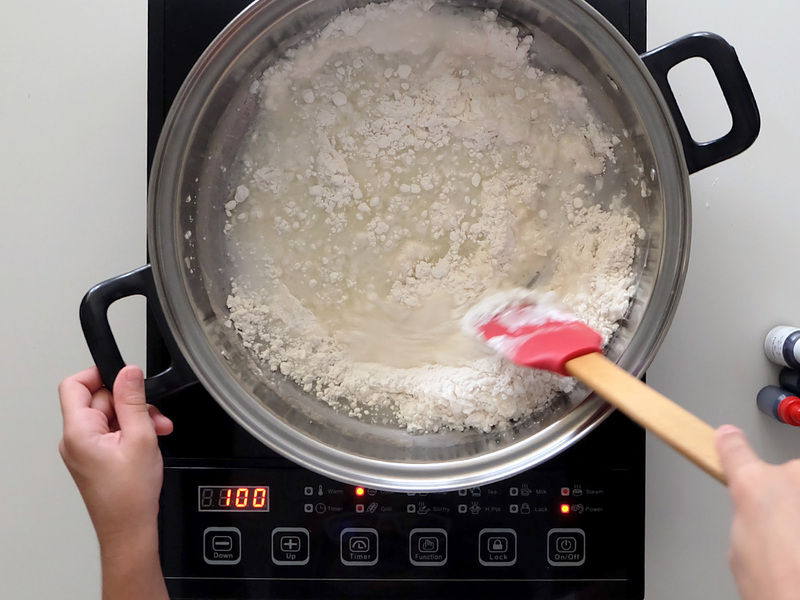 Add 1 cup of water and 1 tablespoon of vegetable or canola oil into the dry ingredients and turn the stove-top on low. Mix everything together and keep stirring until most of the lumps disappear. With a hot pan, this should only take about 30 seconds, so mix continuously. 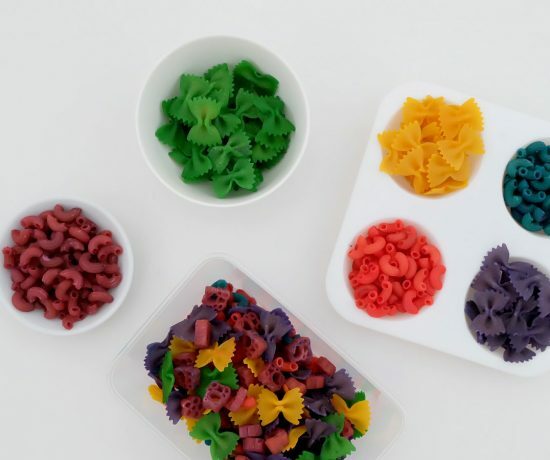 Once you have the right consistency (still runny and not too thick), quickly add your food coloring and mix, mix, mix. 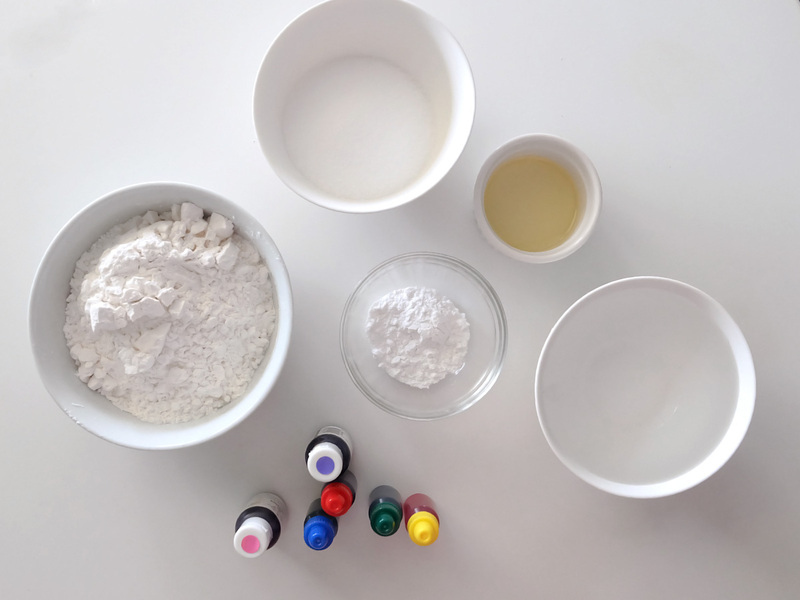 You need to do this fast and watch the mixture, as it gets thick quite fast. It’ll be easier to mix the coloring when the mixture is still runny. Stir the mixture until it becomes thick. You’ll know when it’s done once it starts forming into a ball. The whole process shouldn’t take more than a few minutes, really. The hotter your pan is, the faster it will be. Scoop it out of the pan, and allow it to cool on a plate. 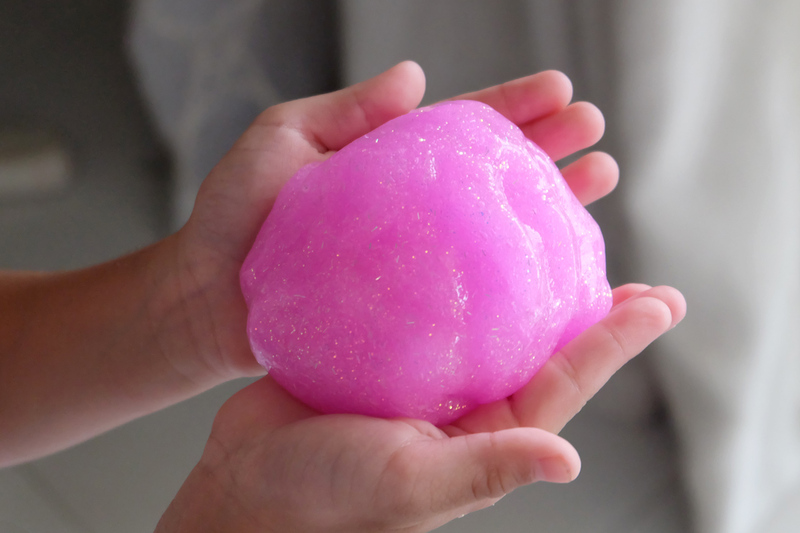 You may also knead it by hand to make sure there aren’t any lumps left, before handing it to your kid. And that’s it! These are super easy to make, you can quickly whip up several batches in no time! 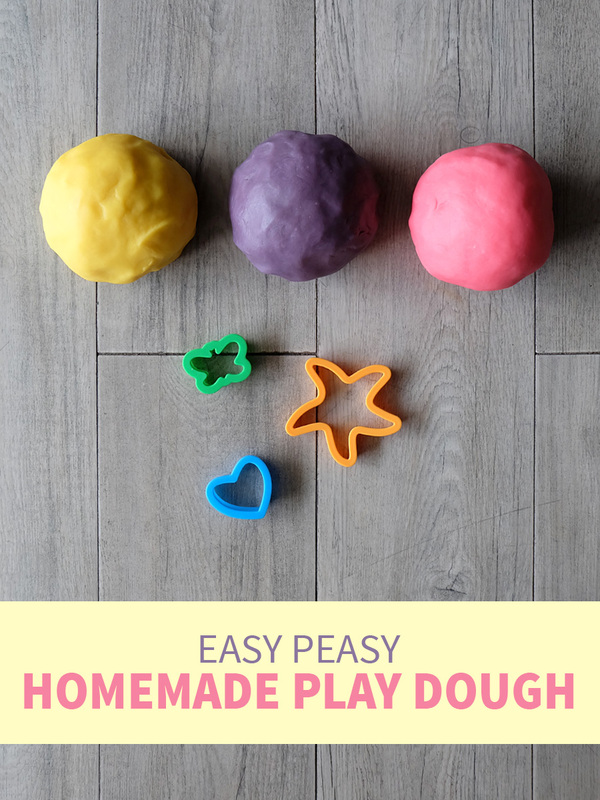 Easy Peasy Homemade Play Dough, ready for some squeezing, molding, rolling, cutting, and shaping! 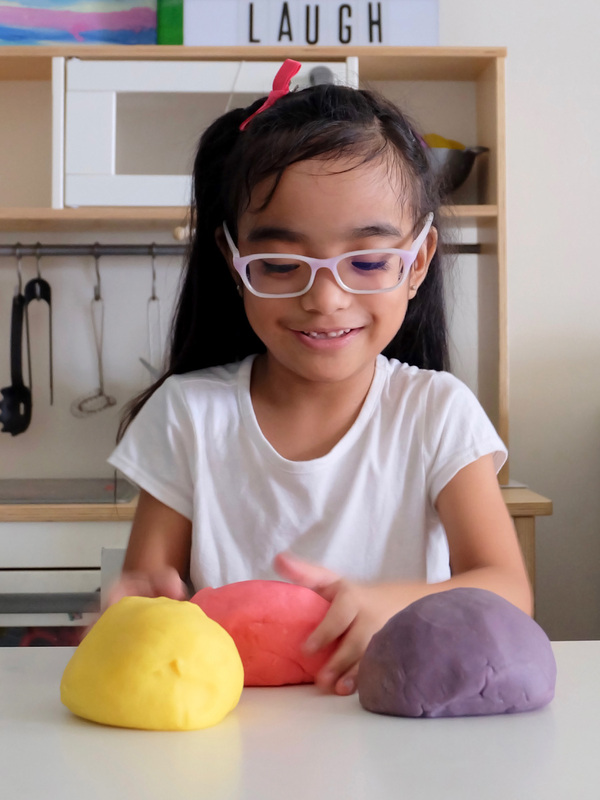 Zoë was ecstatic to see her huge balls of colorful play dough, done within minutes. 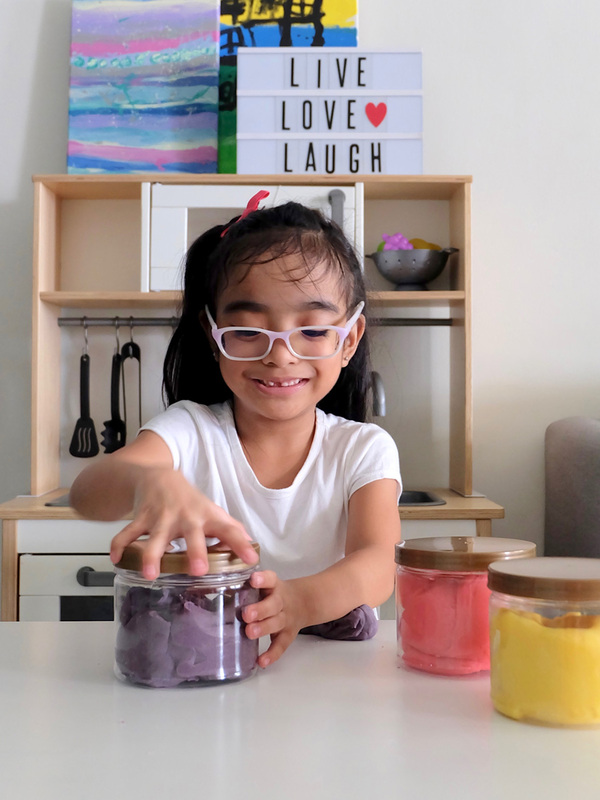 She was even more excited, because she was able to help make each one, too! 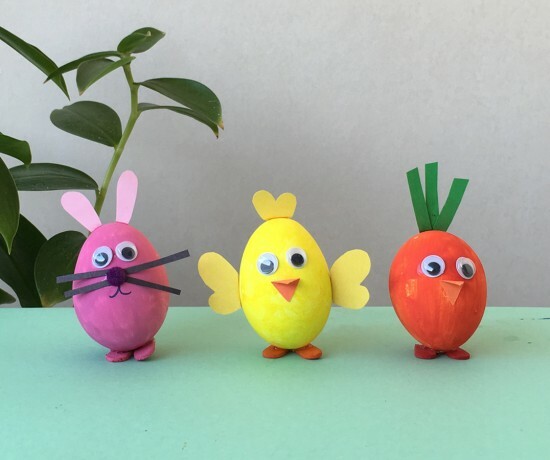 We stored ours in airtight containers, but you may also place them inside ziplock bags, too. These should last us several months of endless fun, play and imagination! 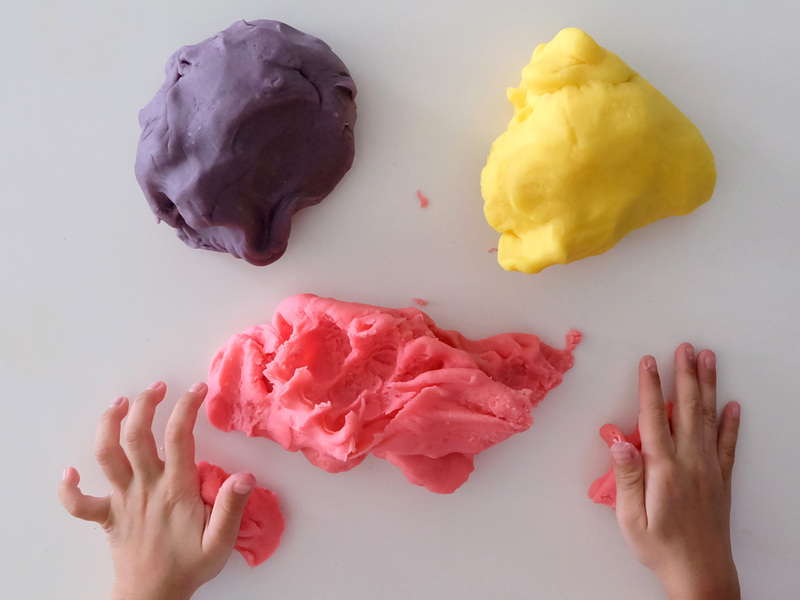 Want to try your hand at making this Easy Peasy Homemade Play Dough? 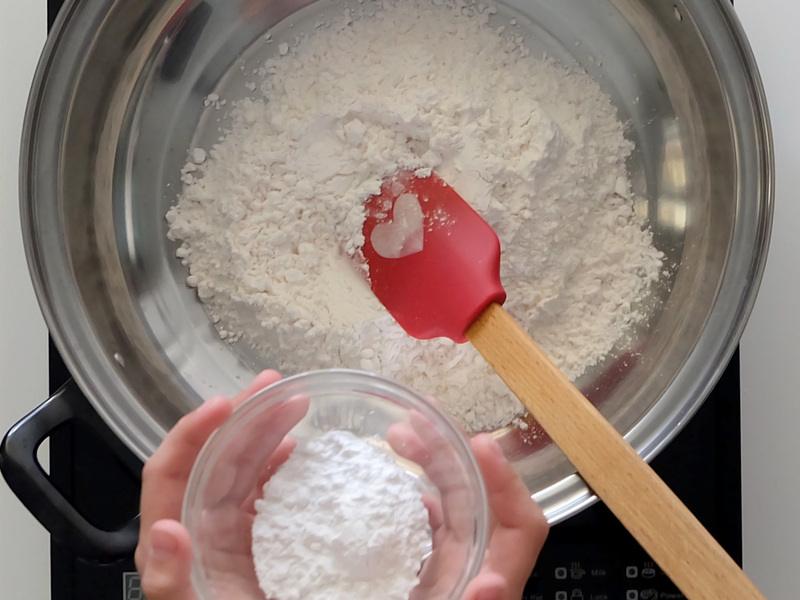 Mix flour, salt, cream of tartar, water and oil in a saucepan. Cook over low heat, stirring continuously. 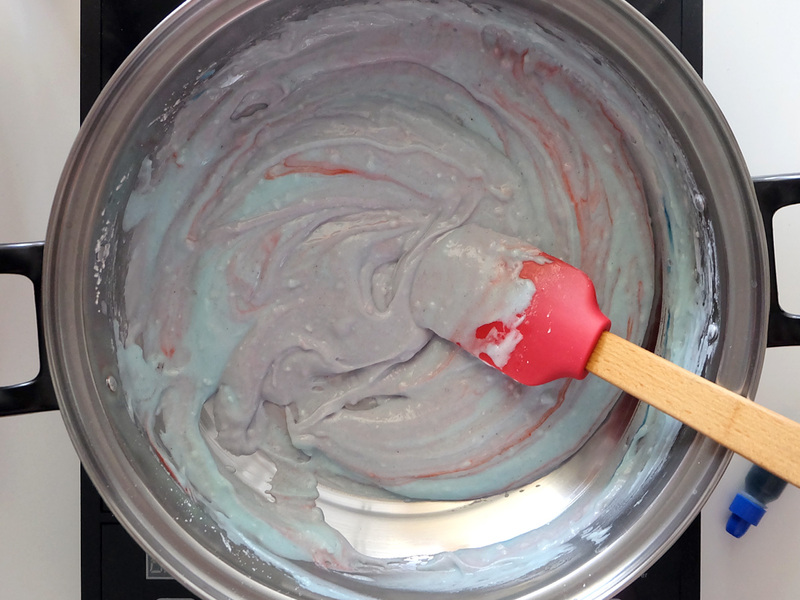 Once the mixture becomes less lumpy, add in the food coloring and stir. Continue stirring until the mixture become thick and it starts forming into a ball. Scoop it out of the pan and allow it to cool on a plate or on wax paper. Knead by hand and play! Store in a ziplock bag or in an airtight container.